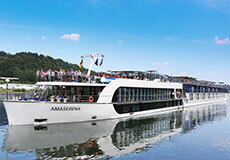 The AmaSerena features the most advanced design of any river cruise vessel currently in operation. Exclusive Twin Balconies are available in most staterooms, which measure a spacious 210-235 sq. feet, with four suites measuring 300 sq. feet. Passengers will enjoy gourmet dining with unlimited fine wines at multiple onboard dining venues; a heated sun deck swimming pool with a swim-up bar; fitness center and spa; complimentary ship-wide Wi-Fi and in-room Internet and entertainment on demand; and a fleet of bicycles carried onboard for passengers to enjoy on their own or on guided bike tours.